There are a few worthwhile shorter options near the parking lot. The short Jomeokee trail around the pinnacle is a must do. There aren't any quad killing climbs at Pilot, but there are just enough uphills and longer distance treks to warrant an overall moderate ranking. The 15-mile trail system at Pilot Mountain State Park winds through the ancient and forested Sauratown Mountains. The featured site of the park is the distinctive, cylindrical pinnacle which erupts some 2,000 feet. This beacon not only calls hikers and climbers to explore the park but is also used by thousands of raptors on their long southern journey to winter in warmer climates. The namesake peak in Pilot Mountain State Park has been a navigational landmark for all sorts of travelers. The tree capped cylinder of rock now beacons hikers and climbers to explore its forest trails and challenging trad climbing routes. The park is split into a northern, mountain section and a river section to the south. The most popular walking route, a nine-mile loop made up of three trails, circles the mountain section. 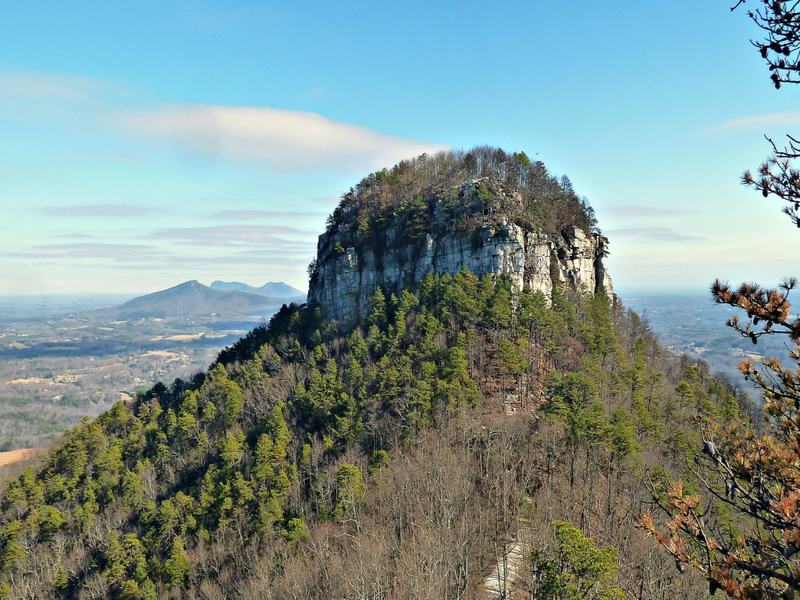 From the main parking lot near the top of Pilot Mountain, follow the Grindstone, Grassy Ridge, and Mountain Trails as they meander up and over the worn down range. You’ll encounter some uphill climbs but most elevation changes are moderate with a few steep areas. The trails are well marked and easy to follow. Saving the best for last, finish your day with a walk on the Jomeokee Trail around the base of Pilot, alternatively looking up at its sheer quartzite walls and off onto the surrounding hills and farms below. Mid to late October is the time to visit Pilot Mountain. Still using the mountain as a point of reference and, sometimes, a stopping point, thousands of raptors sail past on the way from their summer home in Canada and the north east U.S. to their warmer winter digs in central and south America. Broad-winged hawks are the local favorite and groups numbering in the thousands have been viewed on a single day. The most popular section of the park is, of course, the unique peak of Pilot Mountain. Parking within close proximity to the greatest feature of the park makes it easy for even the tiniest trekkers to get up close and personal with the monolith. Plenty of parking and picnic facilities make it easy for a family to enjoy a full day at the park. The longer trails are much less populated and are tread by more experienced hikers and trail runners. The latter being lured by the parks long, smooth sections runnable trail. Most visitors park at the lot near Pilot Mountain. You can find a little less congestion, sometimes, at the lot near the entrance and the park office if you’re interested in the longer loop hike. Both locations have bathrooms and drinking water. Dogs on a leash are allowed on hiking trails and there are no fees for day hiking.